I do so love being able to share an FO post that is a satisfyingly large project, particularly one that has been lurking around my room and projects-to-start/WIP pile for some time ... Linking up this week with hardknitlife Freshly Finished Friday and iknead2knit Flash You Finishes! Pattern - Aran Garter Stitch Cardigan Yarn - Hayfield Bonus Aran Tweed (shade brown) Ravelry project page - here I recieved 2 huge balls of Aran Tweed as a Christmas gift last year, intended to make this cardigan, but it was only in the beginning of May that I finally cast-on (as is the way with all projects, eh?) and I worked on this cardigan over the next month and a half. It is a very straightforward, clear pattern - one size fits all, all garter stitch, simple increases and decreases - which was very appealing to me. 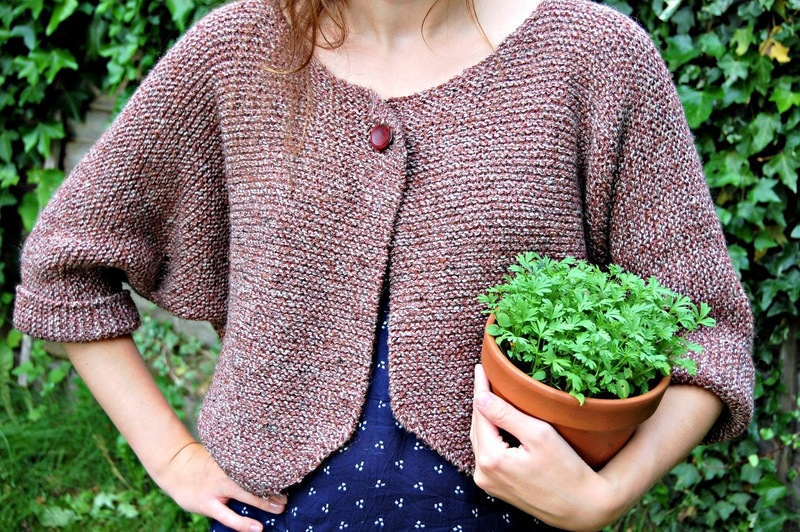 This, and the fact that all the pictures on Raveler's project pages made it clear this would be a versatile and fashionable cardigan. All in all a fast, satisfying knit. It was knit using 5mm circular needles - and circular needles are definitely a MUST here. The whole thing is a single knitted piece and so, as you can imagine, when knitting with aran tweed yarn, things started to get heavy and warm. Circular needles are a wonder to evenly distribute the weight and made for a comfortable experience! There are two reasons why this ultimately took me a month and a half to knit, when I'm fairly certain it could have been finished a lot faster. Firstly, when I really got into the swing of knitting at the beginning of June, and was adding the inches really quickly, I was struck senseless by the Norovirus, and was bedridden for a week. I've never before been unable to do anything except lie in bed and (tentatively) sip Lucozade Sport. Which, obviously, meant knitting was out of the question: heartbreaking stuff. 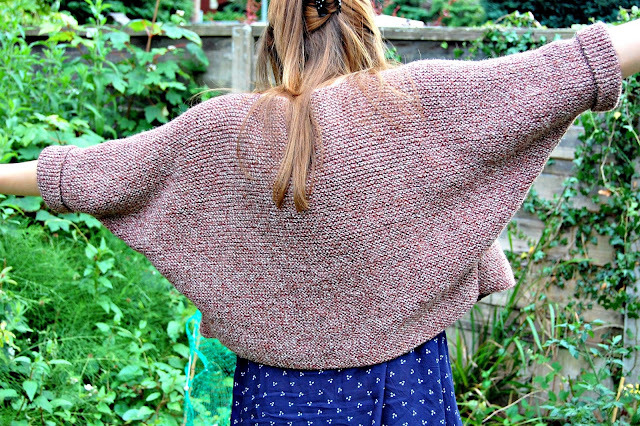 Secondly, even when I finally cast the cardigan on, it took quite a bit of time and energy to really become engaged and to want to see it grow every day. The simplicity of the pattern is also one of the bane's of this project - it would just get very boring. Nothing but knit rows, no patterning, minimal increase/decrease variation, and when there was it was just the same step repeated. I don't want you to get the wrong impression though, I would heartily and enthusiastically recommend this pattern to anyone (beginner, moderate, or experienced knitter). 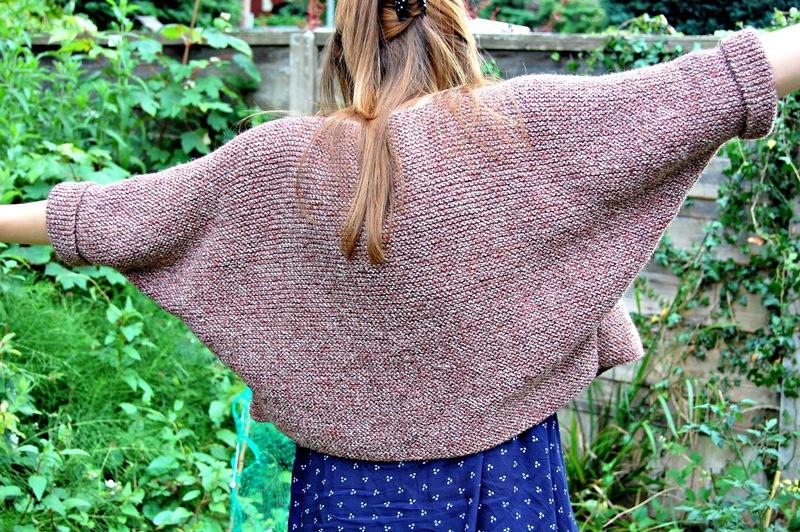 It was very pleasant, once in the swing of the project, to be able to knit and knit and chat and knit and watch TV, without having to constantly check the pattern, but knowing this simple knit would become a lovely cardigan! This looks really good! Hope you're feeling better! Adorable!!! I must mark that pattern for future reference. Yours is just so cute! Sorry to hear you got to horribly sick, glad that you are all better now and managed to finished the cardigan. I love it! The loose fit is so great and would go great with so many different garments. And so interesting that it's knit out of one piece! #christmasinjuly - calling all craft-swappers!